Bonsai's roots can be traced to bonkei which was introduced from China during the Heian period, and since the Edo period it has become more widely popular and developed. 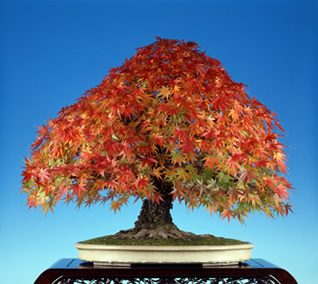 “Bonsai” is now hugely popular and known throughout the world. However, not only is it a plant potted for ornamental reasons, the mimicry of natural landscape, the shaping of the tree during growth and its gradual creation make this very different from other forms of gardening. Cultivation techniques have been established for the purpose of cultivation management - the pruning for shaping the tree's shape and the encouragement of flowering and fruiting - and the same care, in accordance with the season and species, is continued for many years. Old plants can be more several hundred years old and are also referred to as "living art". It may have a constant shape, but the continuing change is where the attraction is found. The attraction of bonsai is the condensation of the beauty of nature. It has a diverse appearance with fine branches reminiscent of large trees, a decorticated trunk that brings to mind old trees and flowing branches that look like they are being blown by the wind. 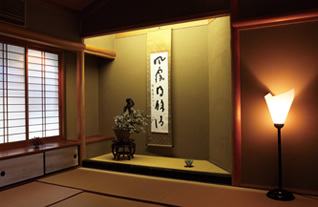 If you decorate together with several bonsai decorations, hanging scrolls, etc, overall harmony is very important. It is a profound world with many other ornamental considerations such as the color and shape of the pot and the compatibility with the decorative table. There is an infinite variety of imaginable scenaries that can be visualized in the eye of the beholder. There is a basic mode of expression and decoration, but first of all, without overthinking, we should have fun thinking outside of the box. There will surely be a view that will come into sight. When it comes to bonsai trees, most people probably think of pine. Pine trees such as Japanese black pine, Japanese red pine, Japanese white pine and conifer trees, are certainly representative of bonsai. However, not only pine is used for bonsai. There are various other species of tree that are used for bonsai, such as those with attractive tree leaves during fall or after defoliation (*1) and flowering and fruiting trees with a pleasant flower or fruit shape (*2). There are also examples of Okinawan banyan tree bonsai. 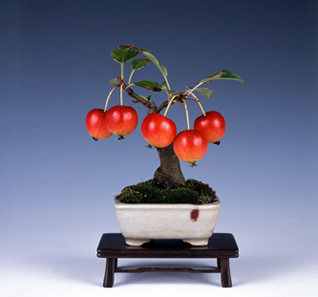 Small bonsai in the size of about 20cm and palm sized "bean bonsai" are also popular. Many bonsai exhibitions are held around Japan throughout the year so, if you have a chance, make a visit and experience the splendor of bonsai. *2　Cherry blossom, Camellia, Apple, Chinese Quince, etc.